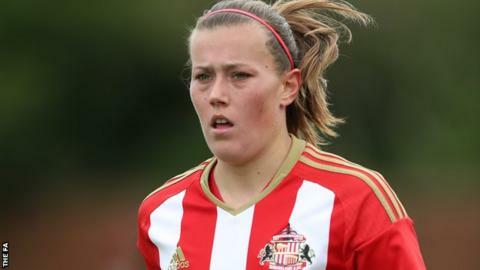 Sunderland moved up to fifth in Women's Super League One with a comfortable win over Birmingham City. Former Verona midfielder Dominique Bruinenberg put Sunderland in front shortly after half-time, firing in from the edge of the area. Hayley Sharp's low finish made it two, before Abbey Joice's well-taken third. Birmingham created chances, but Rachel Williams missed the target, after the hosts' keeper Rachael Laws' double save denied Williams and Charlie Wellings. Defeat was the Blues' third in a row in league matches, while Sunderland - who have played at least one match more than eight other sides - moved within a point of fourth-placed Arsenal. Match ends, Sunderland Ladies 3, Birmingham City Ladies 0. Second Half ends, Sunderland Ladies 3, Birmingham City Ladies 0. Goal! Sunderland Ladies 3, Birmingham City Ladies 0. Abbey Joice (Sunderland Ladies) right footed shot from a difficult angle on the left to the centre of the goal. Assisted by Lucy Staniforth. Attempt blocked. Abbey Joice (Sunderland Ladies) right footed shot from the centre of the box is blocked. Assisted by Bridget Galloway. Attempt blocked. Ellie Stewart (Sunderland Ladies) right footed shot from the centre of the box is blocked. Assisted by Lucy Staniforth with a cross. Foul by Hayley Ladd (Birmingham City Ladies). Abbey Joice (Sunderland Ladies) wins a free kick on the right wing. Foul by Rachel Williams (Birmingham City Ladies). Kasia Lipka (Sunderland Ladies) wins a free kick on the right wing. Attempt blocked. Lucy Staniforth (Sunderland Ladies) right footed shot from outside the box is blocked. Kerys Harrop (Birmingham City Ladies) is shown the yellow card for a bad foul. Foul by Kerys Harrop (Birmingham City Ladies). Abbey Joice (Sunderland Ladies) wins a free kick in the attacking half. Goal! Sunderland Ladies 2, Birmingham City Ladies 0. Hayley Sharp (Sunderland Ladies) right footed shot from the centre of the box to the bottom left corner following a corner. Corner, Sunderland Ladies. Conceded by Jessica Carter. Attempt saved. Charlie Wellings (Birmingham City Ladies) header from the centre of the box is saved in the top centre of the goal. Assisted by Freda Ayisi with a cross. Kerys Harrop (Birmingham City Ladies) wins a free kick in the defensive half. Foul by Bridget Galloway (Sunderland Ladies). Rachel Pitman (Sunderland Ladies) wins a free kick in the defensive half. Corner, Sunderland Ladies. Conceded by Meaghan Sargeant. Corner, Sunderland Ladies. Conceded by Lucy Quinn. Lucy Staniforth (Sunderland Ladies) wins a free kick in the defensive half. Attempt saved. Charlie Wellings (Birmingham City Ladies) right footed shot from the centre of the box is saved in the centre of the goal. Assisted by Aoife Mannion with a cross. Substitution, Birmingham City Ladies. Freda Ayisi replaces Andrine Hegerberg. Attempt missed. Rachel Williams (Birmingham City Ladies) right footed shot from the left side of the box is too high. Assisted by Andrine Hegerberg. Charlie Wellings (Birmingham City Ladies) wins a free kick in the attacking half. Foul by Zaneta Wyne (Sunderland Ladies). Substitution, Sunderland Ladies. Kylla Sjoman replaces Dominique Bruinenberg. Foul by Andrine Hegerberg (Birmingham City Ladies). Attempt saved. Bridget Galloway (Sunderland Ladies) right footed shot from the right side of the box is saved in the bottom right corner. Assisted by Dominique Bruinenberg. Attempt missed. Rachel Williams (Birmingham City Ladies) right footed shot from outside the box is close, but misses to the right. Assisted by Charlie Wellings. Attempt missed. Charlie Wellings (Birmingham City Ladies) left footed shot from the left side of the box misses to the right. Assisted by Hayley Ladd following a set piece situation. Attempt blocked. Hayley Ladd (Birmingham City Ladies) left footed shot from the centre of the box is blocked. Victoria Williams (Sunderland Ladies) is shown the yellow card. Lucy Quinn (Birmingham City Ladies) wins a free kick on the right wing.